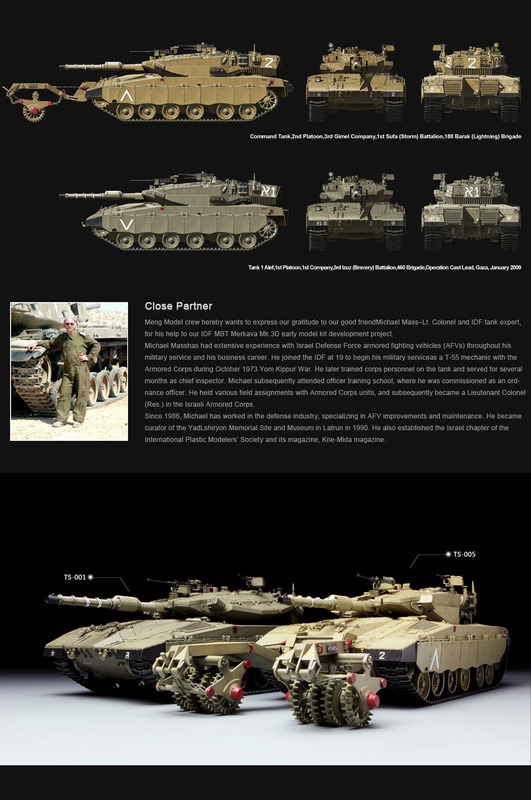 Merkava Mk3 BAZ, one of IDF’s most powerful main battle tanks, has been developed from Merkava Mk3. It has good mobility with a powerful 1200hp engine installed in the front. 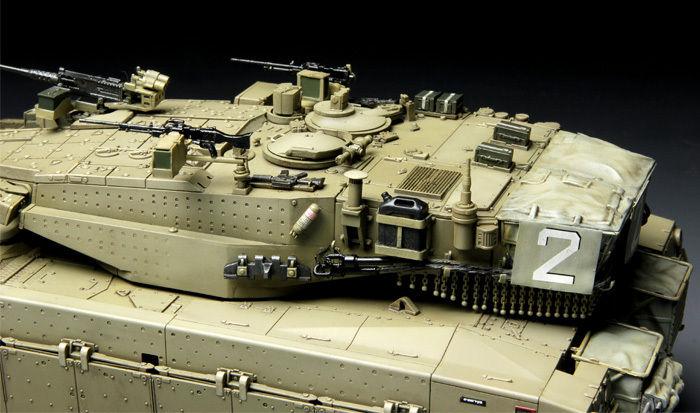 The weapon system consists of a 120mm smoothbore gun and 3 machine guns. Meanwhile, a new gunner’s sight and an additional commander’s panoramic sight are equipped. 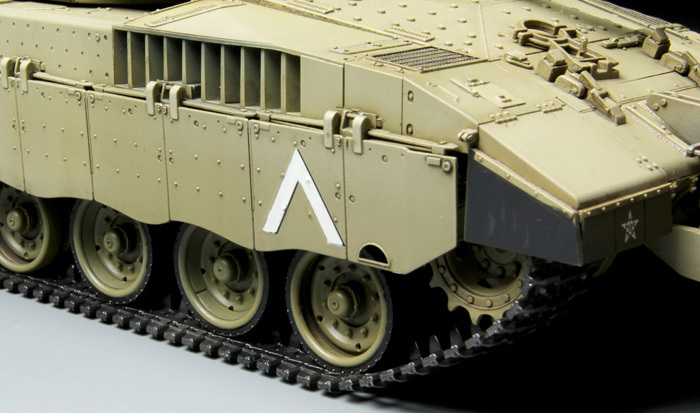 Its heavily armoured engine deck strengthens its front protection. 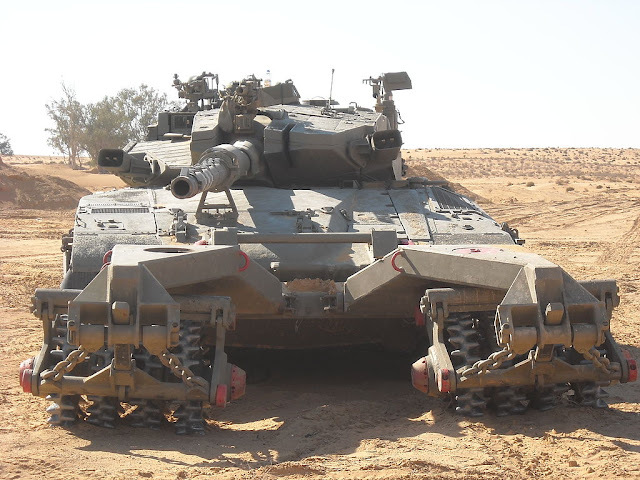 This tank can also be equipped with Nochri Dalet mine roller system so as to clear mines in battlefield. 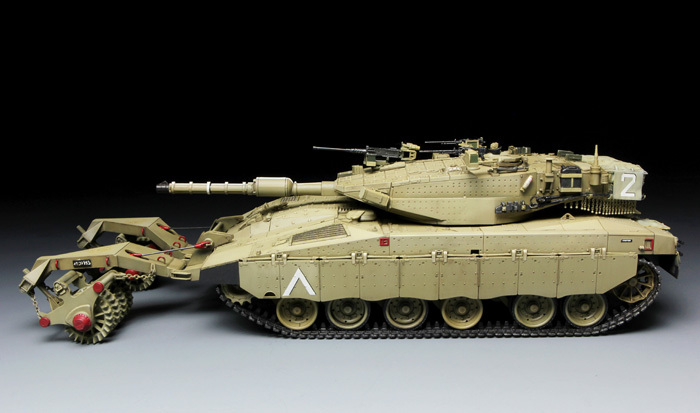 1/35 scale plastic model kit of Israeli Merkava Mk.3 BAZ main battle tank with the total length of 324mm (tank’s total length being 268mm) and width of 111mm. Unique shape of Israeli tanks is precisely reproduced; rubber type and all-steel type of road wheels are included; all baskets can be built to be empty of full; separate side skirts, one-piece TPE tracks and precise and workable Nochri Dalet mine roller parts are included. Two painting schemes are provided. 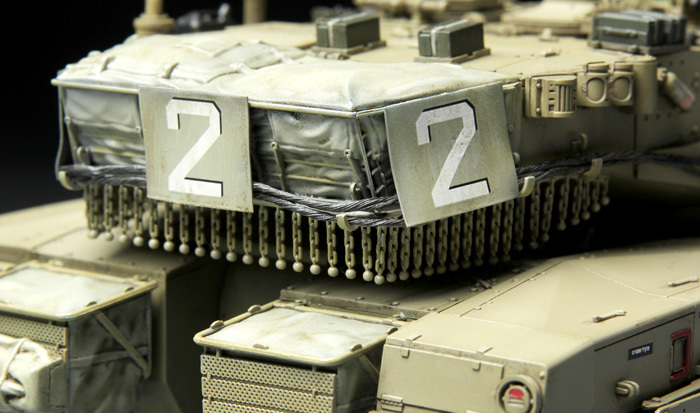 The Israel Merkava Mk.3 BAZ MBT Is Perfectly Modelled And The Unique Shape Of Israeli Tanks Is Realistically Reproduced. 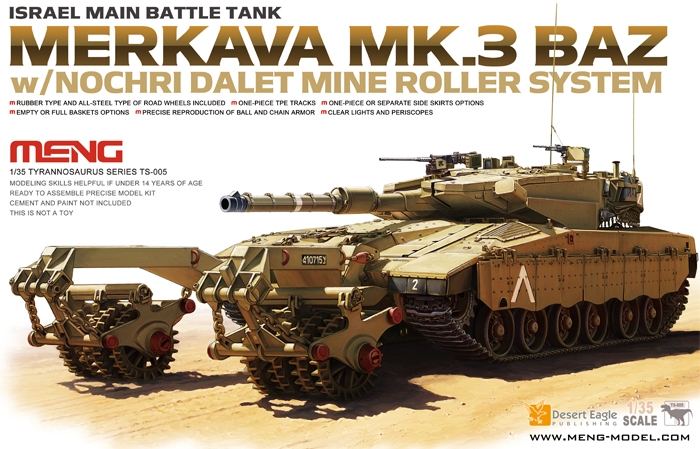 The Tank With Nochri Dalet Mine Roller System Looks More Powerful And Imposing. Newly Tooled Turret Beautifully Represents The Real One. 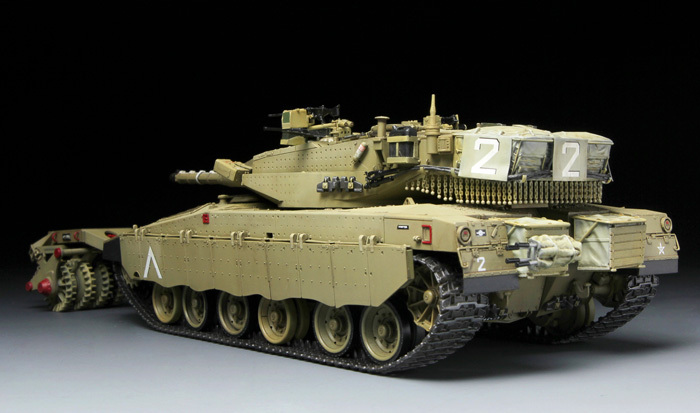 New Sub-Assemblies Including Spare Jerry Can, Rifle And Spare Ammunition Box Reproduce Appearance Of The Real Tank To The Maximum. 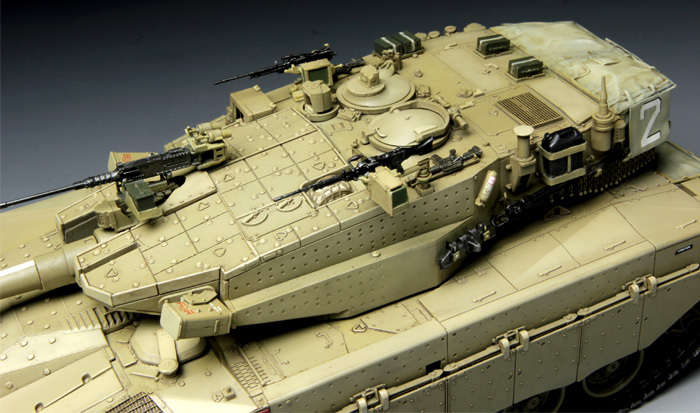 New Stowage Basket Sub-Assembly With A Canvas Bag Reproduces The Real Appearance Of Tanks In Combat. Well-Designed And Precisely-Machined One-Piece Ball And Chain Armour Will Free You From Complicated Assembly. 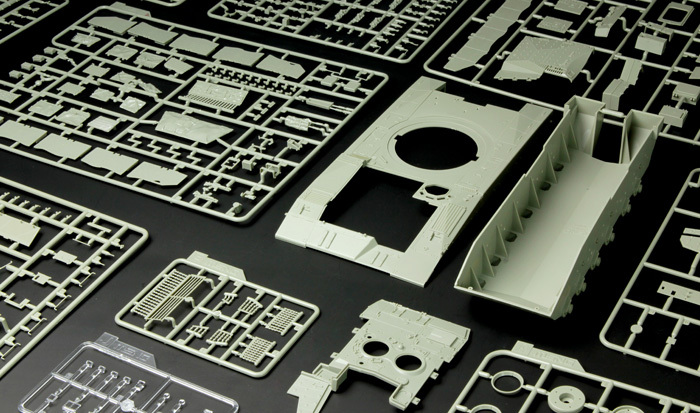 Brand New TPE Tracks Reproduce The Real Ones With Easy Assembly. 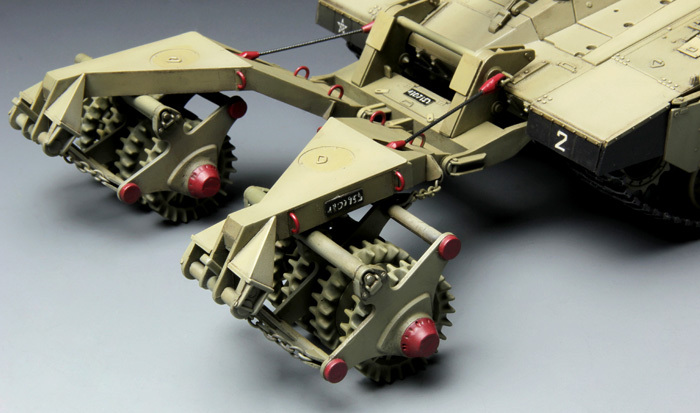 Precise Nochri Dalet Mine Roller System Is Realistically Reproduced And The Additional Metal Chain Makes The Model Look More Real. 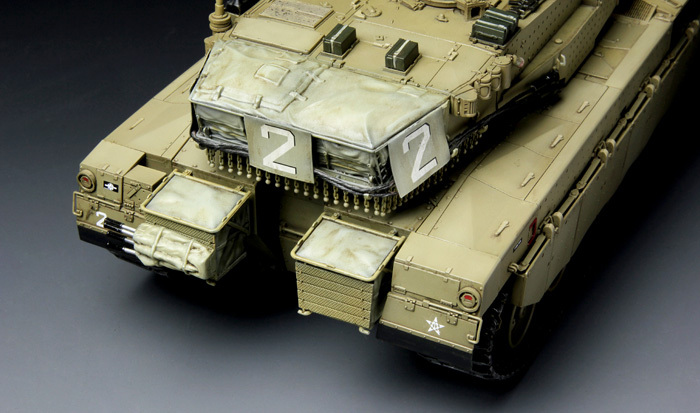 The Kit Contains Grey and Clear Sprues, 1 Decal Sheet, 1 Metal Sheet And Also 1 Metal Chain.